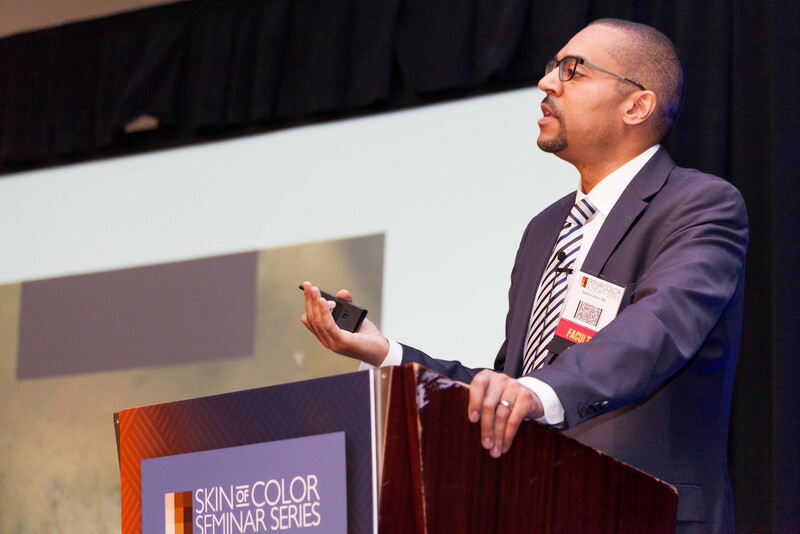 The Skin of Color Seminar Series (SOCSS) is the largest CE event dedicated to trending evidence-based research and new practical pearls for treating skin types III – VI. Each year, esteemed faculty provide attendees with fresh, practical pearls that are immediately useful in their practice. In 2017, co-chairs Eliot Battle, MD and Andrew Alexis, MD gave their insight on everything from PIH to Lasers and everything in between. Don’t rely on most parameters supplied by the laser manufacturers. Treat more conservatively. Minimize erythema or edema. Inconsistent laser treatments on skin of color include: Vascular Lasers, IPL (on Skin Type V & VI) and Resurfacing Lasers (on Skin Type V & VI). When treating patient with skin of color, stay under the erythema threshold. Longer wavelengths, lower fluences, longer pulse durations, maximize cooling. Skin Cooling – Thermal side effects happens when the epidermis heats up > 45 degrees. Treat all Skin of Color patients at max. of 1 hertz. Ethnicity does not predict skin color. Given that PIH can occur as a sequela of acne itself, or as a complication of treatment, treatment regimens must not only be aggressive enough to reduce inflammation and other pathogenic factors, but also well tolerated so that irritation is avoided. Daily hair washing, especially with most prescription shampoos, is often associated with increased hair dryness and breakage; it is also very time consuming for most women of African descent due to common styling practices. 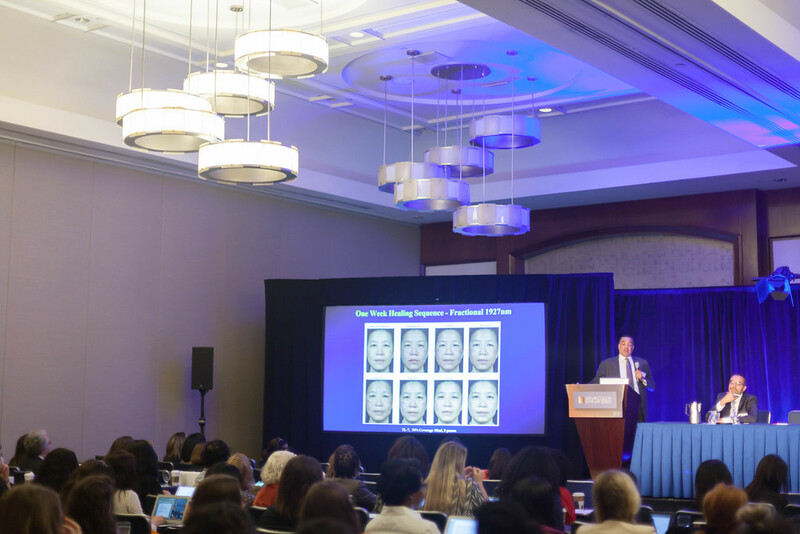 Now in its 10th year, the Skin of Color Seminar Series (SOCSS), May 5-6, 2018 in NYC, is the largest CE event dedicated to trending evidence-based research and new practical pearls for treating the dermatology needs of today’s patients. 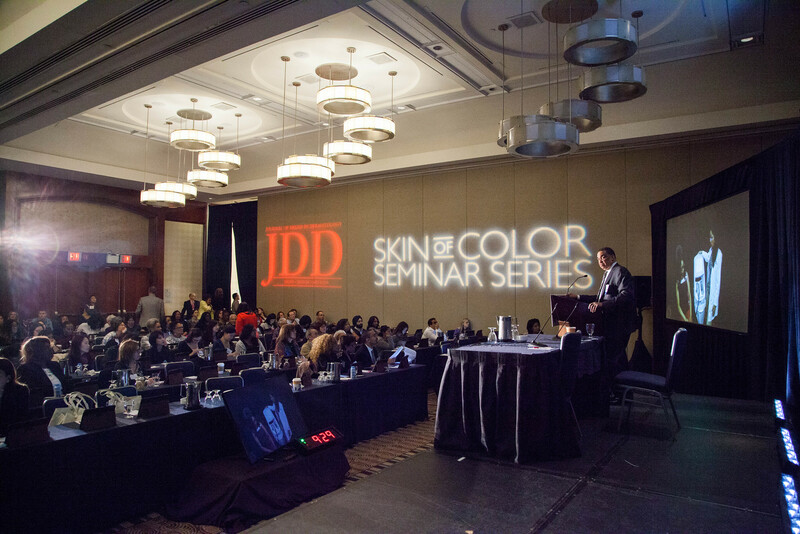 Dermatology experts will gather in the Big Apple to witness world-renowned faculty discuss the latest research, new pearls, trending topics and perform live demonstrations. Always a highlight of the conference, attendees have the rare opportunity to ask their pressing questions to the world’s top skin of color dermatology experts. While the agenda is overflowing with ground breaking, informative talks, here are the top 10 sessions you won’t want to miss…..
Alopecia can be seen in woman and men, and in all nationalities. However, certain beauty habits such as hair styles, frequent chemical processing and innate genetic factors cause those with skin of color to be particularly susceptible to more forms of hair loss.Hair Loss Expert, Dr. Valerie Callender will review the most common types of hair loss in skin of color patients and share her concise and accurate assessment approach for alopecia. Enhance your existing treatment strategies with personal practical pearls from Dr. Callender’s practice, and increase your clinician confidence with medical management of hair loss in skin of color patients. With the thousands of skincare products on the market it can be difficult to know what’s the best for your patient. Dr. Maritza Perez & Dr. Wendy Roberts discuss their favorite products for pigmented skin, which ingredients to avoid, and which ingredients everyone should be using. Participants get the opportunity to touch, feel and experience the latest cosmeceuticals on the market. Lasers have advanced dramatically to the point where we now have numerous devices that are safe and effective for SOC…….in the right hands. 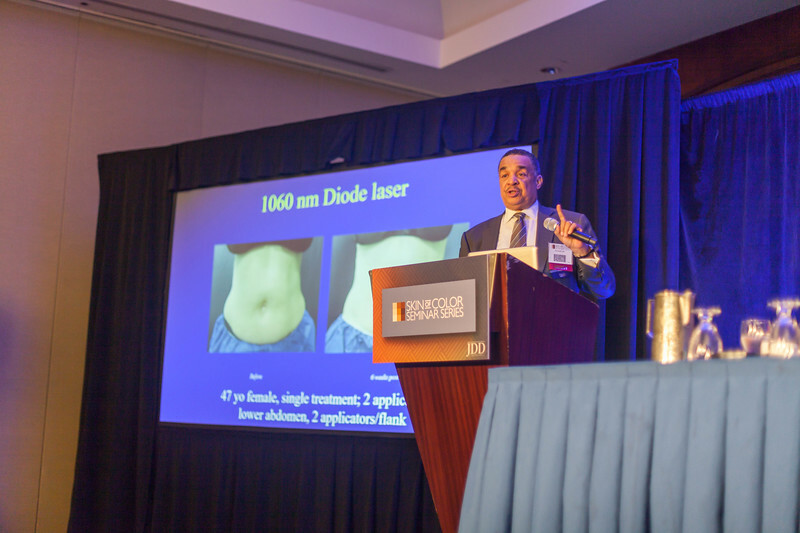 Laser Pioneer, Dr. Eliot Battle reviews how to minimize complications by selecting the ideal laser, precautions, and protocol for patients with skin of color. The CDC announced at the end of 2017 that Sexually Transmitted Diseases are at record highs and continue to increase in incidence. Individuals who fall in the Skin of Color category are at increased risk of acquiring an STD. Dr. Ted Rosen will review epidemiology and clinical manifestations of STDs in the current crisis situation. Attendees will learn to recognize clinical manifestations, manage common manifestations and identify long term risks of STDs. Acne scarring is a physical condition that can have a huge psychological impact, occurring in up to 14% of women and 11% of men. It affects all ages and can destroy self-confidence, affect relationships and even shape the way people live their lives. Until recently, the prevailing opinion was that acne scars in skin of color were nearly impossible to treat given that past treatment options were so ineffective. Our expert faculty will demonstrate one of the most safe, effective, and comprehensive scar treatment programs currently available for pigmented skin. The trend of darker skinned individuals seeking a lighter skin tone is a dangerous one that drives the demand for potentially harmful treatments such as high strength topical bleaching agents and intravenous Glutathione. This expert panel will discuss this sociological health trend, the dangers hiding in some OTC treatments, and the difference between healthy & safe skin lightening and unhealthy skin bleaching. One of the most common dermatological complaints from patients with skin of color is dyspigmentation, particularly hyperpigmentation. The challenge for clinicians is to establish correct diagnoses along with consistently successful treatments to meet the needs of the increasingly diverse population served. Treatment modalities pose many limitations due to the number of treatments required, potential side effects, and overall efficacy. Fortunately, multiple therapies have been delineated that can be moderately to highly efficacious in treating hyperpigmentation in patients with skin of color. Review the newest research and literature surrounding these conditions with Dr. Seemal Desai as he shares his personal practical pearls regarding hyperpigmentation differential diagnosis, diagnostic techniques, and the latest in new and developing therapies. Keloids are a common skin disorder in patients of color, and despite their benign nature, they may create severe aesthetic as well as functional problems that can negatively impact patients’ quality of life. While they are easy to treat, Keloids are characterized by a high rate of recurrence, and surgical intervention can possibly result in even larger lesions. Dr. Baldwin will explore how the patient expectation for surgical removal may not always reasonable/possible/appropriate, and the new evidence-basis alternate treatments available. You’re guaranteed to discover a new practical pearl to put into use in your practice! Dermatological diseases may assume an unusual clinical morphology in skin of color, leading to diagnostic confusion, which in turn, leads to ineffective and untimely therapy. Dr. Alexis and Dr. Rosen will discuss unusual and atypical appearing cases and the proper diagnostic techniques to establish correct diagnosis’ and institute proper therapy. Enhance your consultation skills, improve your techniques, expand your anatomy knowledge and increase your understanding of complication management with guidance and live demonstrations from leading experts in aesthetic dermatology.